I get home with pecans and 6 pairs of new socks, and I’m ready to bake. But… hold on a second. The recipe is two full pages long. It requires a saucepan, pie pan, like three uses of a baking sheet, 8 bowls (exaggeration. maybe. 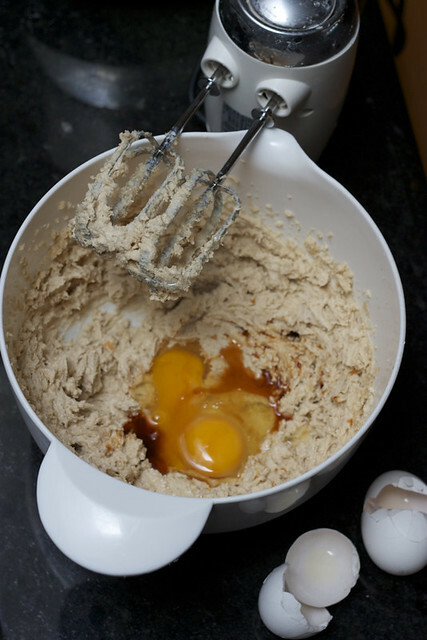 ), egg beaters, and the food processor. I will admit: these are demanding cookies. But they are ooohhhh-so worth it. So if you think that most of your kitchen appliances are hankering for a spin, or maybe feel like washing all of your measuring cups today, GO FOR IT. You will not be disappointed! The finely ground caramel pieces and sweet roasted nuts add a wonderfully unique crunch to these rustic cookies. They’re golden, melt-in-your-mouth crispy, just begging to be dunked in a tall glass of milk. Indulge, it’s the holidays! 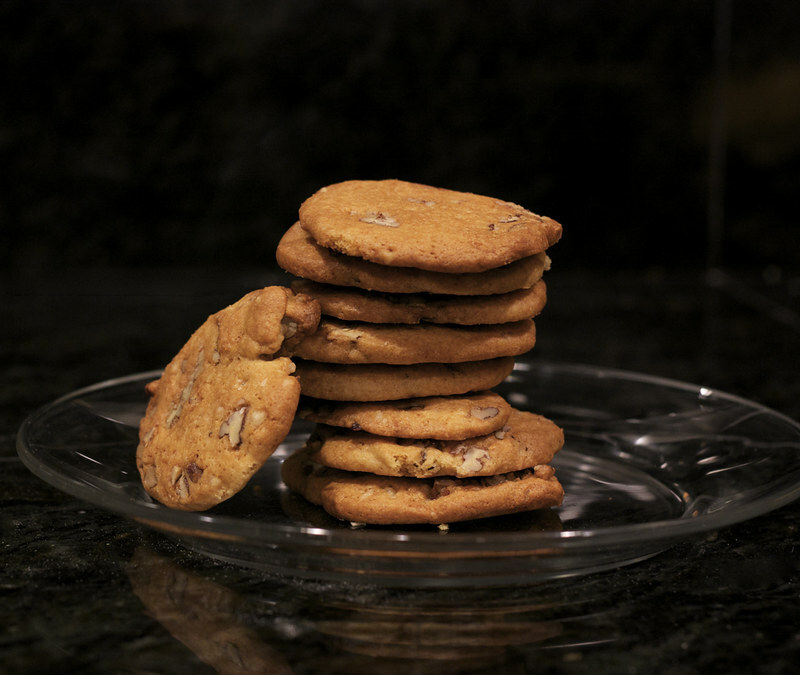 And since this recipe makes a boatload of cookies, you miiiight have a few to give away. Your call. Preheat the oven to 350 degreees F. Line a pie plate or other dish with aluminum foil and coat with nonstick spray. Also line a baking sheet with aluminum foil coated with nonstick spray. You really want the nonstick spray. 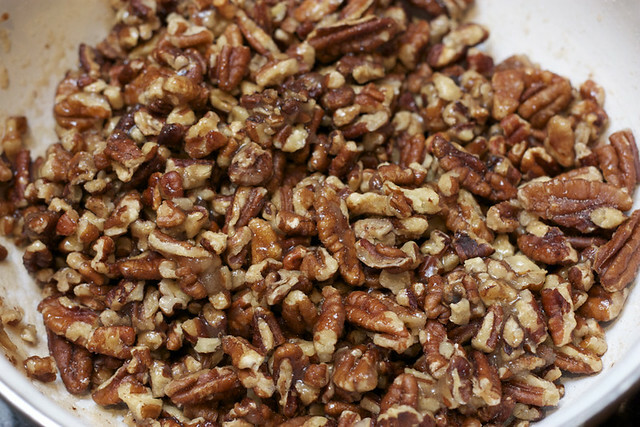 In a medium bowl, stir together maple syrup, 3 tbsp of granulated sugar, and nuts until the nuts are well coated. Spread them on a baking sheet. Toast for 8 to 13 minutes, stirring every few minutes, until nicely browned. Remove from oven and cool. In a 2-quart saucepan over medium heat, stir together remaining 2/3 cup sugar and water until the sugar dissolves. Without further stirring, bring the mixture to a brisk boil over medium-high heat. Continue boiling, lifting the pan and gently swirling the syrup occasionally (but never stirring! ), for 3 to 4 minutes. Watch carefully and remove the pan from the heat as soon as the syrup just turns a medium amber color. Immediately pour into the lined pie plate. Let stand until cooled and hard, about 10 minutes. Break the caramel into chunks. Transfer to a food processor and pulse until fairly finely ground but with some bits visible. In a large bowl, stir together flour, baking powder, baking soda, and salt. 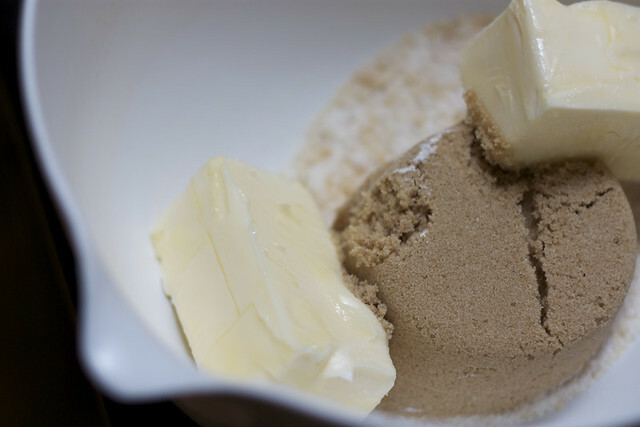 In another large bowl, combine butter, brown sugar, and ground caramel. Beat using a mixer on medium speed until very fluffy, about 2 minutes. Beat in the eggs and vanilla until smoothly incorporated. Beat in half the flour mixture. Stir in the remaining flour mixture, then the toasted nuts, until smoothly incorporated. Now here's where you can diverge... if you're inpatient, or just want fluffy, soft cookies, bake them now. Raise the oven temperature to 375 degrees F. Roll the dough into 1-2 tbsp sized balls, flatten, and place on cookie sheet. Bake for 8-12 minutes, until the cookies are brown around the edges. If you want crunchy, crispity crisps, there are a few extra steps. 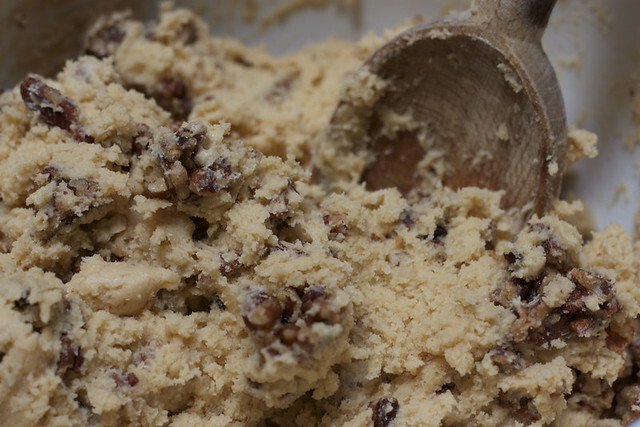 Spoon half the dough onto a sheet of parchment paper. Roll the dough into a foot-long log with lightly greased hands. Twist the ends of the parchment paper to keep from unrolling. Repeat with remaining dough. Refrigerate until completely firm, at least 3 hours and up to 2 days. The logs will keep, stored airtight, in the freezer for up to 12 months! Partially thaw in the refrigerator before using. Position a rack in the upper third of the oven and preheat to 375 degrees F. Line several baking sheets with parchment paper (or just one if you only have one!). Peel the paper off one log. Cut into 1/8-inch-thick slices (mine ended up about 1/4-inch-thick) using a large sharp knife. Transfer the slices to baking sheets, spacing them about 2 inches apart. Repeat with the second log, or save it to bake another time. Bake one sheet at a time for 7 to 11 minutes, or until the cookies are golden all over and just slightly darker around the edges. Transfer the sheet to a wire rack to cool. Let the cookies stand for 5 minutes to firm up before transferring to the rack. Let cool completely. Or not!